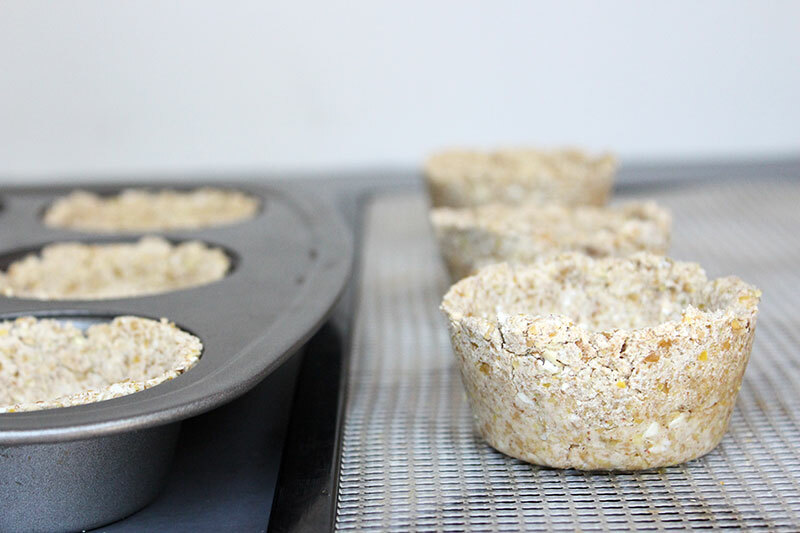 Sprouted buckwheat makes a wonderful crispy raw vegan pie crust, I just had to make a separate post especially for it! 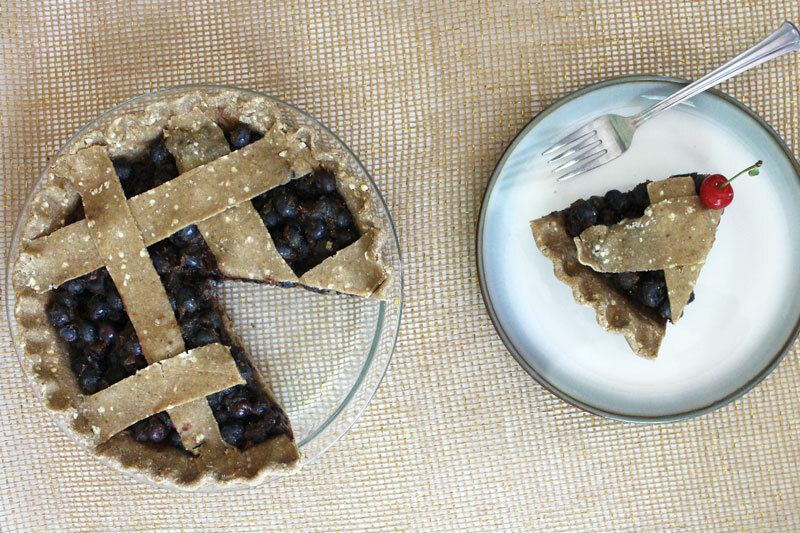 Hurray for the cool crisp air that fall brings and double hurray for pie season! Luckily I’ve got you covered with this sprouted pastry dough, good for raw vegan blueberry pie, strawberry rhubarb pie, apple pie, pumpkin pie, and pretty much any other pie you can think of! I love this crust because it is super crispy, light, and reminds me of real pie crust. The thing is, I love the way raw vegan food makes me feel, but I love the textures of cooked foods. It has been my mission to closely replicate all the familiar textures of my favorite foods, and I believe this pastry dough is a success, alongside the sprouted wheat berry pastry dough! The main purpose of buckwheat is the crispy/crunchy factor. To achieve the crunch, the buckwheat is soaked, can be sprouted, and dried. Buckwheat groats are pretty flavorless, but let them sprout too long and they’ll have a distinct grassy taste, we don’t want that. Soak the buckwheat for about 2 hours or more, generally once the water starts fizzing I know I need to rinse and drain. Rinse and drain every 6-8 hours,you can keep the buckwheat in a strainer over a bowl to catch the drips and cover the whole thing with towel to prevent dust and debris. Buckwheat takes about 1-2 days give or take. Let the buckwheat fully drain before blending with the other ingredients, you don’t want to make the dough too sticky or wet. 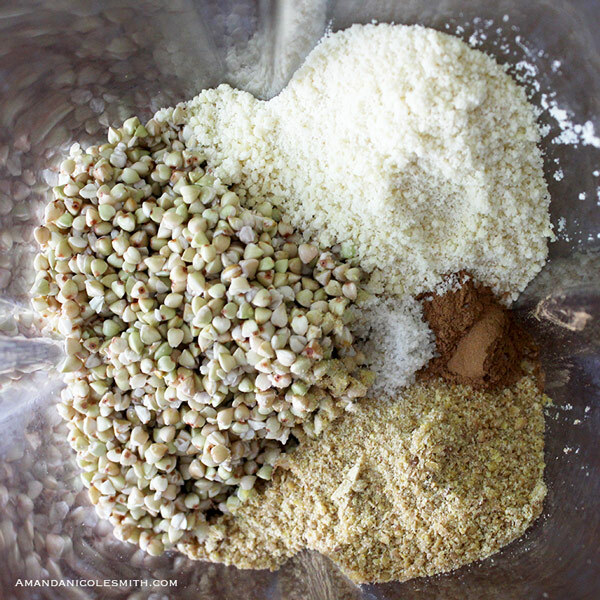 The buckwheat is then mixed with the rest of the ingredients, either in a food processor or blender such as a vitamix. This will create a giant dough ball. If the dough is too sticky, you can leave it in a bowl, covered with a towel and it will start to dry fairly quickly. Or you can add more almond flour to absorb the moisture. This pastry dough is shaped just like regular pie crust. The only difference is that you don’t have to flour the surface when you roll, you can use almond flour if you wanted, but instead you can put the dough in between plastic wrap or parchment paper and roll to make life easier. Make sure you roll the dough, rotating it clockwise, so you get a nice even circle. You can make the crust as thin or thick as you prefer, it just has to be big enough to cover the pie dish you plan on using. The thicker, the crunchier and the longer it will take to dry. You could also make mini crusts, using a muffin pan, by making small dough balls and rolling them out the same way. I like to roll my dough out with parchment paper on the bottom so I can easily rotate the dough clockwise in between rolls. It is also easier to transfer the crust by putting the pie dish on top pf the crust and gently flipping it over, and removing the parchment paper. 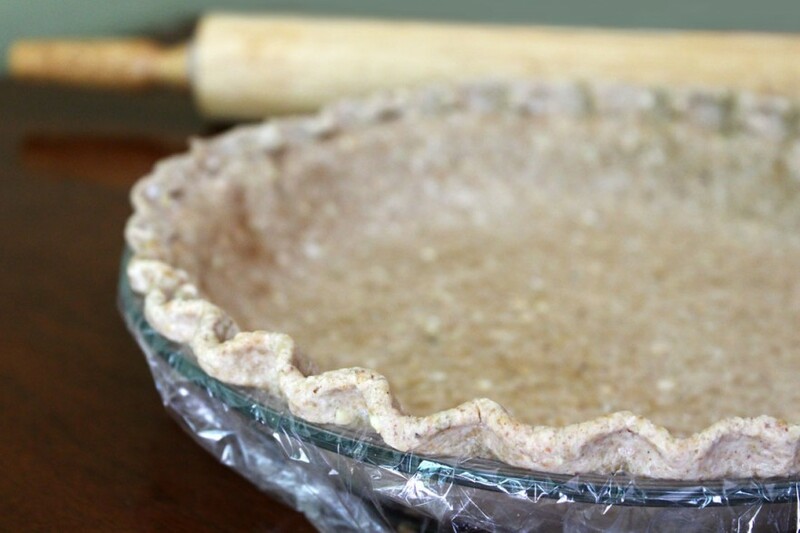 The pie crust should be draping over the sides; you want to cut a nice even line all around the edges, leaving a 1/4 inch over-hang. Roll the over-hang so you have a nice folded edge all the way around. Pinch a section of the crust with your index finger and thumb, use your other thumb to push in-between your pinch. Do this all the way around to achieve a crust like the one in the picture below. 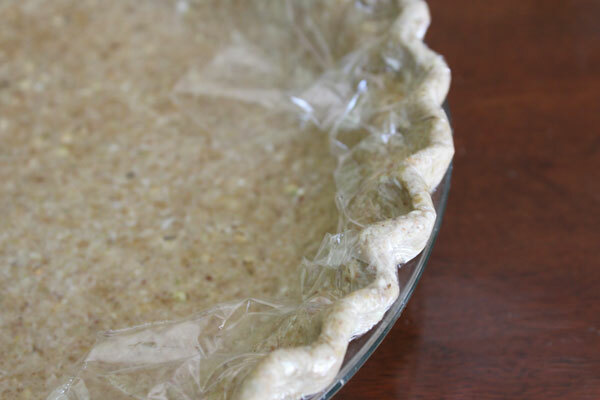 If you keep plastic wrap underneath your pie you can use it to shape the crust to prevent the dough from sticking to your fingers. The crust is then dehydrated at 115 degrees for 1 hour in the pie dish, it should then be able to come out of the pie dish and hold shape on its own. You want to put it on a ventilated surface, so it dries efficiently the rest of the way. It should only take another 20 minutes for the crust to completely dry. This is where you add your filling and either dehydrate it all together or serve as-is. You can also dehydrate the crust at 165 degrees for a faster approach, but it may not be “raw” anymore. Same goes for an oven, crack open the door and use the convection setting if you have one for the best results. Time will vary so check often and don’t let it over dry. Gluten-free sprouted pastry dough that turns crispy when dry, perfect for pie. Soak buckwheat groats for 4-6 hours. Rinse and drain in strainer every 8 hours for 1-2 days until little tails have sprouted. Add all the crust ingredients to a blender or food processor and process until well mixed. Form a dough ball and put it in between two fairly large sheets of plastic wrap or parchment paper. Roll out the dough thinly. Peel one side of the plastic wrap off, and drap the crust, plastic side down, over a 9-in pie dish. Cut away the excess crust to use for lattice. Dehydrate at 115 degrees for 1 hour. After 1 hour it should be crispy on the inside, take the crust out of the dish and carefully remove the plastic wrap. Dehydrate the crust on a ventilated surface for another 20 minutes, or until the crust is crispy on both sides. Once crust is dried you can add whatever filling you want, as long as it is not super wet. If it is wet try to dehydrate the insides in a separate bowl before filling crust.